Organizations of all sizes are faced with the challenge of managing massive volumes of increasingly valuable data. However, storing this data can be costly, and extracting value from the data is becoming more and more difficult. IT organizations have limited resources, but must stay responsive to dynamic environments and act quickly to consolidate, simplify, and optimize their IT infrastructures. 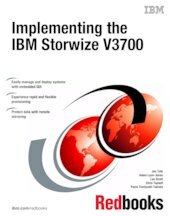 The IBM® Storwize® V3700 system provides a solution that is affordable, easy to use, and self-optimizing, which enables organizations to overcome these storage challenges. Storwize V3700 delivers efficient, entry-level configurations that are specifically designed to meet the needs of small and midsize businesses. Designed to provide organizations with the ability to consolidate and share data at an affordable price, Storwize V3700 offers advanced software capabilities that are usually found in more expensive systems. Built on innovative IBM technology, Storwize V3700 addresses the block storage requirements of small and midsize organizations, Storwize V3700 is designed to accommodate the most common storage network technologies. This design enables easy implementation and management. Web-based GUI provides point-and-click management capabilities. Internal disk storage virtualization enables rapid, flexible provisioning and simple configuration changes. Thin provisioning enables applications to grow dynamically, but only use space they actually need. Enables simple data migration from external storage to Storwize V3700 storage (one-way from another storage device). Remote Mirror creates copies of data at remote locations for disaster recovery. IBM FlashCopy® creates instant application copies for backup or application testing. The concepts in this book also relate to the IBM Storwize V3500.